The TomTom VIA 53 is the all new 2017 TomTom navigator that has been specifically to stop the recent Garmin dominance across the last few years in the sat nav range in the UK. Up until recently Garmin simply offered a superior product that TomTom could not compete with. This model has been designed to stop that. The key difference between The VIA53 and recent TomTom's satnav is the VIA53 has traffic alerts to go with the free map updates. Garmin have offered this facility for the last few years, whilst TomTom only offered it on the more expensive models and even then it was not that good. There are many TomTom lovers that are totally convinced TomTom satnavs are the best sat nav on the market. They feel the interface works better, they’re fast at calculating routes and the directions are better. However there has always been a problem with buying a TomTom. You had to accept that you had no Traffic information, whilst buying a Garmin would mean that you had both free map updates and free traffic alerts. Personally we feel that Garmin Navigators are a better value for money option than their TomTom counterparts. In the past, you could get traffic alerts, but you had to pay a premium for them and get the TomTom 6100 which did not make sense. Whilst TomTom did come with a better selection of driving features, not having traffic alters meant there was no way you could ever rate a TomTom satnav as your best satnav. This VIA 53 has been designed to change that. The VIA 53 comes with a great 5-inch Pinch&Zoom, Interactive smart screen that offers the ability to view maps and directions in direct sunlight or low light conditions. In the past, we have felt that the pinch and zoom on TomTom’s was not as good as the Pinch&Zoom on Garmin’s, however with this new model, the pinch&zoom is easily as good and if not better than the Garmin. Switching on the VIA53, it quickly loads up to the menu interface thanks to the all new and dramatically improved processor. The improved processor speed not only means a faster screen boot, but also faster calculations and most importantly, faster re-calculations when you take a wrong turn. The maps and directions have not changed over the last few years given they were already very impressive. The maps are full of information and the step-by-step directions are very easy to follow. Whats great is the TomTom comes with free lifetime map updates as as we mentioned previously, free traffic updates. This is the first time we have seen traffic updates on a mid-spec TomTom and we’re pleased to say they are very good. Of the other features that come with your TomTom VIA53, we really like the ability to connect your smartphone to the Sat Nav via bluetooth for hands free calling and to activate and talk to Siri or Google Now directly through the satnav. We have not seen this before, but with the developments of both Siri and Google Now and to an entent most AI units, sat nav’s will head in this direction. In a few years time, there will be no more entering your destination into a unit, it will all be done through the AI and your voice. Performance is great and easily competes with every other Garmin satnav on the market. That all said there are a few things we don’t like about the VIA53. Firstly, it only comes in a 5-Inch screen size. Personally I don’t like my screens smaller than 6-inches as I feel this is the smallest screen size to be able to see your directions. Other things I hate, you have access to speed camera locations but only for three months, after which you need to pay extra for it. You also have access to TomTom's MyDrive which allows you to plan your route ahead of time, however its pretty difficult to use although the biggest problem we found with the VIA, you still only have access to a points of interest database, there is no trip adviser content as you get with the Garmin. Overall its a fantastic sat nav, however it still has a few problems that we don't much like. The key problem that it only comes with a 5-inch screen that we feel is too small for everyday use. 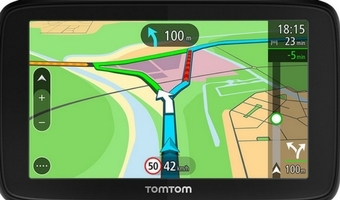 That said, for TomTom lovers, it's the go-to sat nav and if I liked 5-inch screens I would be a buyer of this sat nav.